The Mona Lisa is undoubtedly one of the most recognizable images in the world. Perhaps second only to the Eiffel Tower, it is an icon of the tourist experience of Paris. So, when we arrived at the Louvre with thousands of other tourists, of course, the first thing we did was go to see it. I have heard that often when tourists first see the Mona Lisa hanging in the Louvre, the portrait is much smaller than they expect. 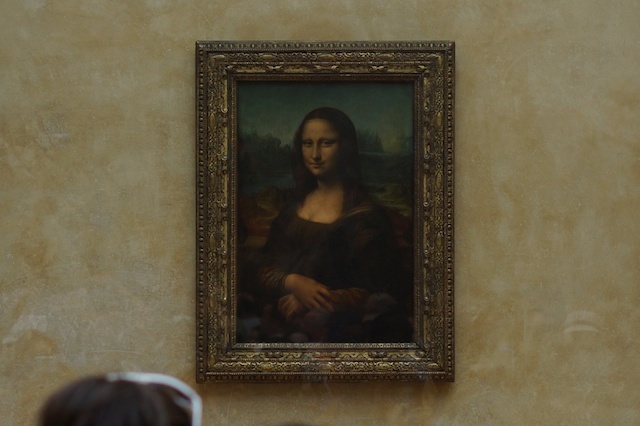 The idea, I guess, is that the endless reproduction of her image in multiple media across the entire world has inflated the expectation that the big deal of finally seeing the real thing should somehow be reflected by the scale of the portrait—that Lisa should be as big as she is famous. Perhaps because I was anticipating the real Mona Lisa would be smaller, when I finally saw the original she was just about the size I expected. I was not, however, prepared for the scale of the crowd that crushed into the room to see the portrait. Hundreds of tourists streamed through the large gallery and paused momentarily near the far wall of the gallery to see it. I actually should say “see it,” because most visitors didn’t actually spend much time looking at the Mona Lisa with their own eyes. The majority glanced only briefly at the painting before reaching for digital device with which to capture her image. As Pierre Bourdieu has observed, photography involves the choice to take a specific photo among the infinite number of possible photos that might be taken. We often think of cameras in the analog mode of “capturing” a photo with the click of a shutter. Tourists’ digital devices, however, receive a constant flow of data as updated on their camera screens. They then selected the moment(s) that they want to fish out of that stream and retain for the future. 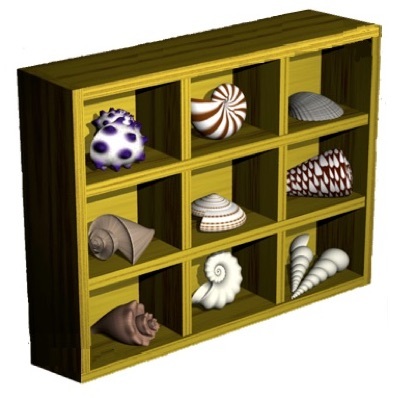 When confronted with a two-dimensional painting fixed to a wall and cordoned off by security, however, the variety of images one can chose to make are dramatically limited. 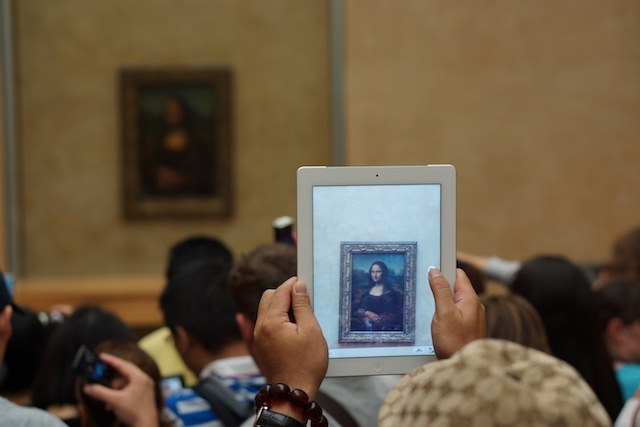 The fascinating thing about the tourists’ behavior is that very likely all of the hundreds of photos that were being taken that morning of the Mona Lisa were reproducing roughly the same image. Just do a basic Google image search for “Mona Lisa” and you will get tens of thousands of tourist photos that are basically identical. Why would tourists flock to the same place and take nearly identical photographs of the Mona Lisa from roughly the same vantagepoint? Clearly the tourists, following Walter Benjamin, upon encountering the Da Vinci portrait from which the numerous reproductions that they have seen their entire lives have been made, pressed as close as possible for an encounter with the original. Relying on huge zoom lenses and high megapixel cameras could be seen as means to enhance the view—technological aids to get even closer to the authentic painting. 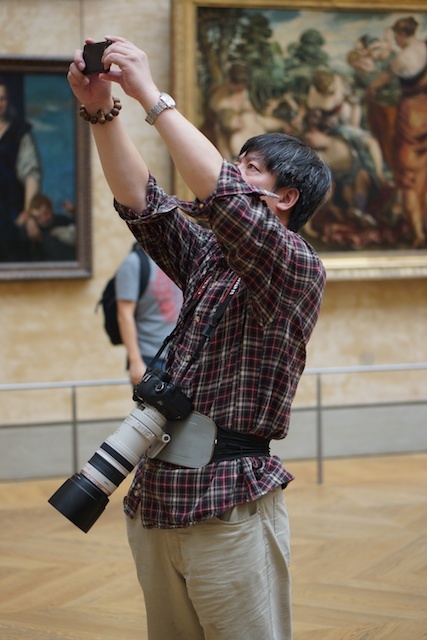 The behavior of digital imaging at the Louvre, however, seems to me to be something more than just tourists trying to capture something of the original with their cameras. When faced with the original Mona Lisa, it seemed to me that tourists could only appreciate it by reproducing it. Faced with the aura of the authentic, they responded by immediately creating their own personal digital reproduction—just like the ones they have seen their whole lives, but also their own. The gallery became, then, not simply a place where original paintings are finally seen but, thanks to the ubiquity of digital imaging devices, it a place of consumption. Museum visitors no longer need to wait for the gift shop to satisfy the frustrated desires stoked in the museum—they can now satisfy themselves on site in the gallery by digitally consuming with their devices. By the way, here is the photo that I took of the Mona Lisa—not to be confused with the other ones you might see. I’m not sure I agree with the vacuum analogy. Taking a picture, even one that’s like so many others you can find, allows you to tell others that you were there. I don’t think you’re taking anything away from the environment, or cleaning it. When you mentioned cleaning people, I was thinking of forensic scientists. I think of their role as sanitizing a location, extracting as much information as possible, but leaving it fundamentally changed.